Technical Analysis and Elliott Wave Theory: Elliott Wave Update Week 44 2009 ~ Is this a real bear? Elliott Wave Update Week 44 2009 ~ Is this a real bear? or is it just another bear trap? 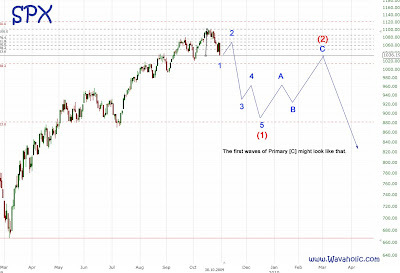 SPX: Although we can't be certain yet, it looks like the last week could have been the beginning of a new bear. After the drop below 1075, the blue forecast having been confirmed, the market fell apart (see my chart from Wednesday). Now it looks like the first wave down is completed. 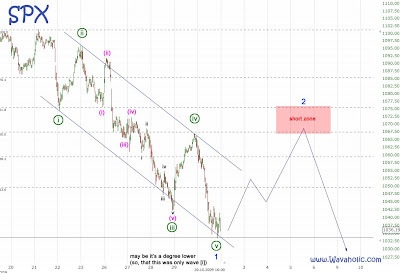 The common target for wave 2 is between the 50% and 62% retracement level; if the market moved above it, I would start to worry (if you're a bear ofc). So, a short trade around 1070 with a stop at 1102 and a target somewhere in the low-mid 900's looks really nice.